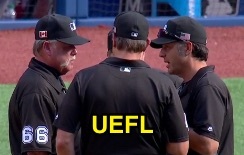 1B Umpire Jim Joyce ejected Blue Jays Manager John Gibbons for arguing a Replay Review decision that affirmed Joyce's foul ball call in the bottom of the 9th inning of the Red Sox-Blue Jays game. With one out and one on, Blue Jays batter Russell Martin hit a 1-0 fastball from Red Sox pitcher Craig Kimbrel down the right field line, initially ruled fair by Joyce before Joyce reversed the call to that of "foul ball" during an ensuing conference amongst the umpiring crew. Upon Replay Review as the result of a Crew Chief Review, Joyce's ruling was affirmed as replays do not indicate the ball struck the outfield wall in fair territory, the call was correct. At the time of the ejection, the Red Sox were leading, 11-8. The Red Sox ultimately won the contest, 11-8. This is Jim Joyce (66)'s second ejection of the 2016 MLB regular season. Jim Joyce now has -3 points in UEFL Standings (-7 Previous + 2 MLB + 2 Correct Call = -3). Crew Chief Jim Joyce now has -5 points in Crew Division (-6 Previous + 1 Correct Call = -5). This is the 158th ejection report of the 2016 regular season. This is the 63rd Manager ejection of 2016. This is Toronto's 16th ejection of 2016, 1st in MLB/AL East (TOR 16; BOS 6; BAL 3; NYY, TB 2). This is John Gibbons' 8th ejection of 2016, 1st since Sept 4 (Pat Hoberg; QOC = Y [Balls/Strikes]). This is Jim Joyce's first ejection since September 8, 2016 (AJ Hinch; QOC = N [Foul/HBP]). Wrap: Boston Red Sox vs. Toronto Blue Jays, 9/11/16 | Video available via "read more."